The RG Center 'Rhythmic Dreams will host the Second Annual Boston Invitational at the field house at Newton South High School on Feb. 21-22. 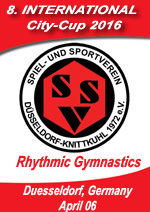 The German Gymnastics Federation (DTB) inform that the federation in co-operation with Rhenania Gymnastics Federation (RTB) and the World Games 2005 GmbH are planning to organize a Rhythmic Gymnastics Group Competition on May 21/23 2004 in Duisburg, the Host City of the World Games 2005. They hope that the FIG will accept this competition as a World Series Competition. Out of danger are the first three places on top of the GYMmedia World Ranking List of Rhythmic Gymnastics, although the Byelorussian Inna Zhukova won the all-around competition last weekend in her hometown Minsk. With a projektion of 188 points are the trio Kabaeva/Bessonova/Yerofeeva in front,followed by Shukova on fourth place. Inna Zhukova (BLR), 4th of 2003 World Championships, won the all around competition and the final with clubs of 7th Grand Prix tournament of 2003 series in Minsk. Svetlana Rudalova got 2nd place on all around, Vera Sesina (RUS) became 3rd. 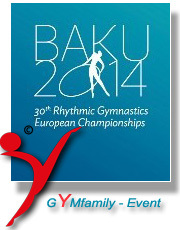 In absence of the Ukrainian gymnasts Svetlana Rudalova won the final with hoop. The Russian gymnasts Olga Kapranova (ball) and Vera Sesina (ribbon) were the best of the other finals.